If an emergency ever arises where you need to bug-out, where are you going to go? If you live in a large city there are going to be potentially millions of people nearby, all panicking and posing as possible threats. So what are the United States’ most densely populated areas? As you can see in the satellite image above, there are some regions that are much darker than others. These areas would be the ideal remote fallback areas where you would want to bug-out to. These remote locations serve as ideal bug-out-locations since less people are likely to be nearby. Privacy = safety. Ideally, you’ll want a survival retreat to be far away from big cities and other high-density areas. You’ll also have to weigh the fact that if you ever did need help from others, the farther away you are from people the farther away you are from help. Check out these 4 maps, illustrating differently the United States’ population densities (and 1 map including the world’s). 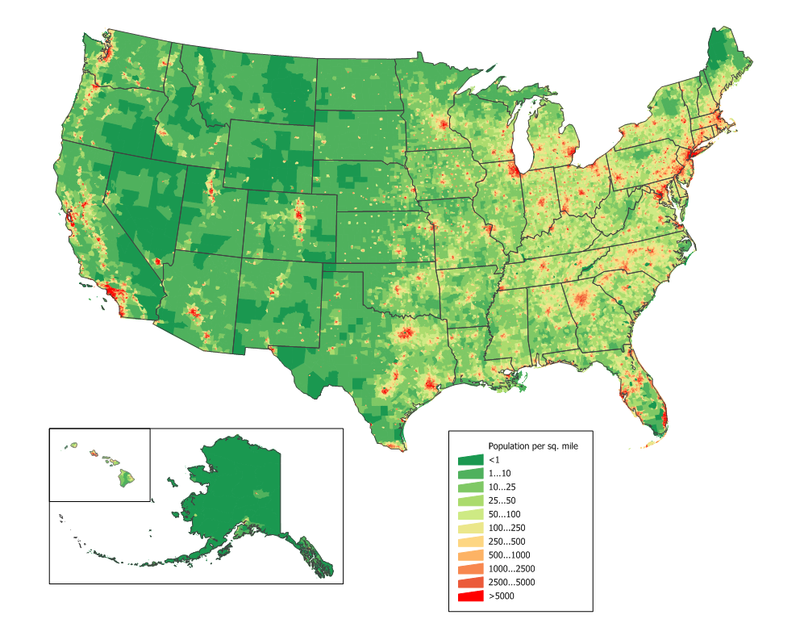 The map above shows the average U.S. population per square mile. The darker the red, the denser the population. The map above is a 3D version of the previous one, also showing Alaska. This map shows a little more clearly the biggest cities – places like Miami, New York City, and Dallas are easily seen. This is a world map showing Earth’s population density. The population of the U.S. in 2012 was 313.9 million. Compare that to India’s 2012 population of 1.237 billion and China’s 2012 population of 1.351 billion. Now that you can see the population densities on these maps, find your location on them and the nearest or most accessible location that has a low density. If you want to remain relatively close to civilization, pick a bug-out location with a nearby town of no more than 5,000 people. There are hundreds of other population maps, so click here to check out some others! Do some research in your area, buy a map, and start planning!